Check-in is from 3:30-5:00 p.m. When you arrive please follow the signs down to the main parking lot. Check-in takes place in the 'Oaks Chapel', near the main parking lot. Posted outside the Oaks Chapel will be cabin assignments. Your camper can immediately move into their cabin. We only need one parent to go into the Oaks Chapel to check in. If you have already made all payments (including canteen money), you can turn in any forms that you may have at the first table, and you are done. If you still need to make a payment you will be given an invoice at the first table, then you can get into the payment line. This line is usually short. 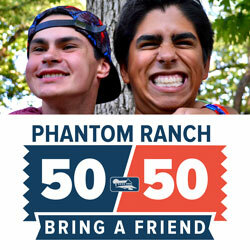 You can also pay your balance online - www.phantomranch.org/payment.htm. After you check in, you should pick up a t-shirt if you bought one, and talk to the Health Supervisor if you need to turn in medications or have other health concerns for your camper. Camp sessions finish with a closing program which starts promptly at 9:00 am on Saturday morning. This closing program usually takes 20 minutes. After the closing program parents can collect their camper’s luggage and complete the check out process. Each camper needs to be checked out of their cabin with the counselor, receive canteen refunds, and get left over medication from the Nurse. By 10:30 am, at the latest, you should be on the road. Upon arrival please proceed directly to the main parking area, and follow staff directions to the appropriate meeting room for your session. Horsemanship programs end with a horsemanship closing program at the horse area which starts at 9:00 am. Upon arrival horsemanship parents can proceed directly to the horse area parking lot at the first turn when entering the camp. The horsemanship closing program usually ends about 10:15. Then parents can proceed to check out their campers, receive canteen refunds, and get left over medication from the Nurse. The cabins have twin size bunk beds and bathroom facilities, including a shower. Bring a pillow, sleeping bag or linens (sheets & blanket), and toiletries: soap, towels, toothbrush and toothpaste. Bring adequate underwear, socks, shirts, shorts, and jeans for seven days. A form of foot wear is required at all times. Additional items: sandals, one-piece bathing suit, beach cover-up, pajamas, slippers, sweater or jacket, rainwear, sun screen, insect repellent, Bible, pencil, and stationary (we sell stamps at the camp store). Optional items: fishing tackle, flash light, camera. Do not bring: Electronic / video games, any type of music players, magazines, cell phones, paintballs or paintball markers. 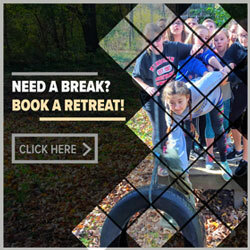 All camp fees are due on the first day of the camper's session. All prescription medications will be given to the Nurse. Over-the-counter medications will not be accepted by the Health Supervisor. Please label everything your camper brings to the Ranch. Please DON'T arrive earlier than 3:30 p.m. on the Sunday of the session. Our Welcome Staff won't be ready! 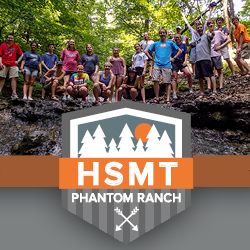 We want to give your camper a great Phantom Ranch welcome! We have several proven methods for dealing with homesickness, especially among our younger campers. These include keeping the camper occupied, engaging them in activities, and encouraging them. When the camp directors feel it may be helpful we may call a parent to talk about other solutions. After this conversation we may have the camper talk to the parent, however, in our experience, this conversation can make the situation worse. In fact, we have found that child sick parents leads to homesickness among the campers. If parents come to visit or desire to speak to their camper on the phone during the week (especially younger campers) the camper usually gets more homesick and their camp experience is diminished. Parents have every right to visit or talk to their children, and we would not do anything to hinder this right. On the other hand, we know that campers really enjoy going home after a week of experiencing everything that camp has to offer. This includes the cabin experience, being with their friends, and not focusing on distractions. Our staff are well qualified and trained to meet every campers needs. We have a few guidelines regarding electronic devices, behavior, and visiting. We do not allow campers to have their own cell phones or have unauthorized use of other telephones. We want your child to focus on camp and not on external distractions. All guests (including parents) must check in at the office during office hours, or with the program director during other hours. Non-parent visits are extremely discouraged. We want the camp experience to be special, one of the ways we do this is through limiting access to music players and other portable devices. Please take any music or video devices that your child may have with them home with you, or turn them into the counselors. Lastly, we have a very low tolerance of campers playing destructive practical jokes or of campers sneaking out at night. If your camper is caught engaged in a destructive activity or being out after curfew we will immediately call the parents and may have them come to camp to get their child with no refunds. If you have any questions throughout the week, would like to check in on your camper, or need to make contact with your child, please call Dan Mayer, our program director, on his cell phone: 312-320-1036.